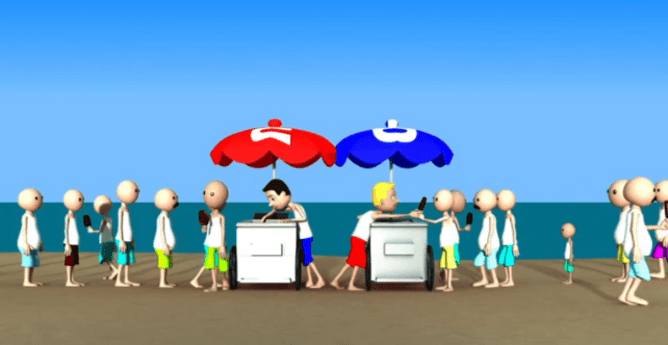 Brush And Crush: Part 2: Sports betting – friend, foe or something in between? The wagering value sports betting offers may present a challenge. Within perhaps weeks the Supreme Court will share their opinion on the legalization of sports betting. Most observers think the court will grant New Jersey’s request – that is, the game that was in the shadows for so long may be legal in 20s or more states. In Part 1 we examined from a bullish perspective what the decision may hold for horse racing. In Part 2 we’ll dive into the other end of the pool. What problems does a new competitor on the landscape pose for this sport in terms of customer demand? In our travels we’ve all noticed companies who sell the same products – burger joints, gas stations, hotels — located beside or across the street from one other. This isn’t by accident. A spatial model by Harold Hotelling showed that businesses seek a specific location to maximize their reach, and that optimal point usually ends up creating a cluster. These clusters only work if the firms are selling similar products, with similar pricing. This system is good for consumers because they can maximize their utility — they can comparison shop, save time if one store is too busy, and both firms will act in their best interests. In Part 1 we detailed how sports betting and racetrack wagering in Australia have coexisted and even thrived. In my view, one reason they have done so is because they fit the clustering success criteria. If you want to bet a soccer match or a Cox Plate in Sydney, you are in almost exactly the same system. Bets for both offerings can be made on a betting exchange or by fixed odds. There’s the sameness of mode and medium. 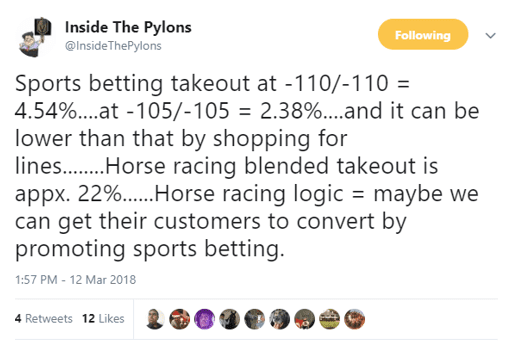 Similarly, the takeout for win betting in horse racing (the most popular betting in Australia) is very close to equal that of a sports betting wager. Exchanges offer takeout around 8 per cent, and fixed odds can be not far off that. Because horse racing has more outcomes than say a rugby match (a 10-horse field versus a win or loss) this pricing is arguably equal (or even better for racing customers). 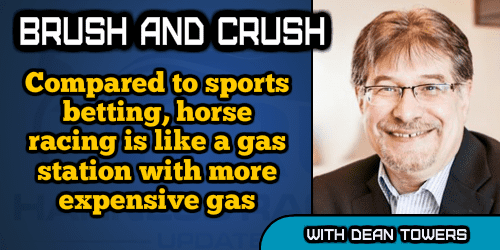 In Australia, horse racing and sports are selling the same gas for $2 a gallon, reaping the rewards of the cluster. And, so far at least, both entities have done pretty well. Flipping back to North America, it’s not quite like that. Here, we have one entity selling gas in a different system for 50 cents a gallon less, and the numbers bear that out. The interest in wagering on sports has been on the rise. 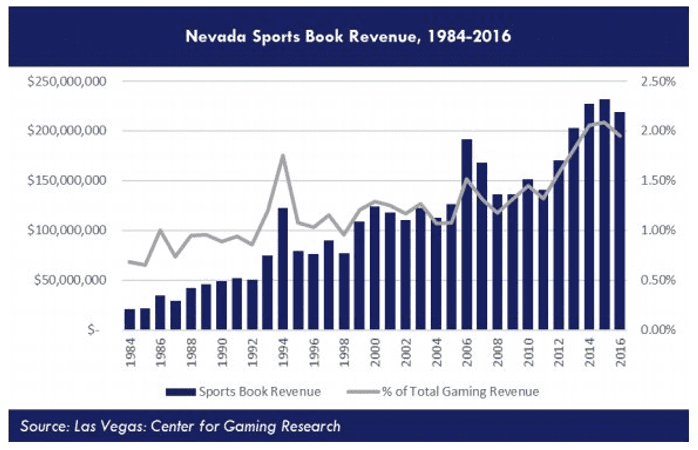 Through increased demand, Vegas casinos and sports books have seen revenue jump by more than 400 per cent from the early 1990s. Takeout rates have stayed at the same low levels. So, we have a pretty attractive, low-priced product entering horse racing’s space. And this type of wagering has positive momentum, even with its non-legal status. 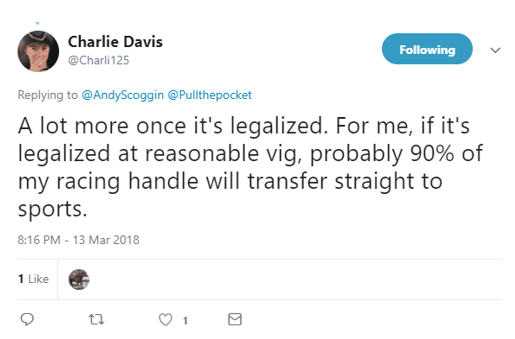 It should be clear that if legalized, it’s poised to capture more of the market, and in practice, every day horseplayer Charlie Davis illustrates this phenomenon in his recent tweet. How many punters will exhibit the same behavior as Charlie is anyone’s guess at this point, but it’s certain that at least some will. What can racing do to ensure a mutually beneficial cluster here in North America? The simple answer to this complex question is that racing should do what Australia (and others) has done – allow the opening up of the betting markets by the Supreme Court to create the needed system of sameness through innovation; that is, offer fixed odds or exchanges to racing punters. But that’s a non-starter. Churchill Downs Inc. and Magna will not be supporting an exchange platform backed by TVG, and a fixed odds betting system put forth by several disparate entities is not only sub-optimal for growth, it will probably never see the light of day in the first place. In lieu of real, structural change, I think horse racing has a few practical alternatives. In effect, I believe they’ll have to do much of what offshore sites like Pinnacle have done with eSports betting. They built a specific narrative, package and strategy to attract customers to this new form of wagering, and have successfully created more demand, while at the same time kept their existing customers happy. 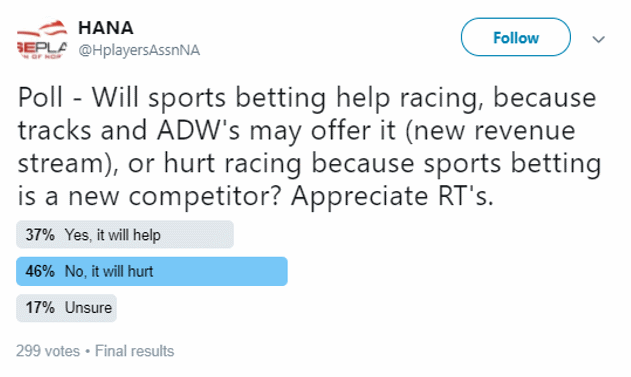 There was a poll last week on the Horseplayers Association twitter feed that showed no one was particularly sold on what exactly legalized sports betting will mean for the future. After writing both parts one and two of this series, I think the crowd is pretty sharp. I too think we can can’t conclude anything concrete. Horse racing and sports betting have happily survived in Hong Kong and Australia already. Horse racing and (mostly illegal) sports betting has done the same in North America. The two games are similar but different, and they fill a niche. When they’re grouped together there is evidence of synergies which appear to help both. Despite those potential positives, there is a negative, and it’s a big one. While clustering works for fast food restaurants, adding a betting competitor with a pricing and momentum edge on your premises can be perilous. One thing I think we can all agree on is that horse racing should be prepared. It should be ready to not only offer sports betting, but build strategies to attract new sports betting customers to racing, while developing techniques to hold onto their existing customers. Right now we have not seen or heard much in that vein. Let’s hope that changes, because it’s a virtual lock that the skill game wagering landscape will look a whole lot different in the very near future. Horse racing needs to be ready.